When you sign up for my email gardening newsletter I will notify you when I schedule or add a new class or special event. Come to this class at the Farmer’s Market and get some plants and wonderful organic fruits and veggies and listen to how easy it is to grow them in our valley. I’ll talk about how I grow them to get the abundance of fruit and veggies and the huge size that we all lust after. This class will be on the southeast side of the valley, near Pecos and S. Flamingo, at the home of Robert and Cody, who have graciously offered their beautiful garden for a class so those of you on the SE side of town won’t have to drive to the NW side. But, if you haven’t been to the Test Garden yet, sooner or later you will need to make that short trip to see our bulging beds of veggies and how we do things. No need to make a reservation for this class, just show up. Please allow yourself enough time to fight traffic and find the address and park. If you can, please be a little early. The Test Garden is open almost 24/7. I like to take a break on Sundays; shop, lunch with friends, other stuff. But sometimes I just stay home and veg-out, so Sundays are iffy; call first for Sunday, I may be home. We are always here Mon through Sat., but after dark and after 5 p.m. is by appointment, please. I will have a booth stocked with Hawaiian Tropic tomato plants. I am bringing my special tomato and vegetable plants, and other gardening products we use in the test garden, to the Craft Fair at the Springs Preserve. I hope I will see you there. Bring a cart or wagon so you will be able to tote all the great items you want to buy. What a great place to have a craft fair, we are all excited about this one. The first 10 people to come to class will receive a free pack of seed as I use. I’ll share my tips on how to increase your harvest and the size of your fruit. 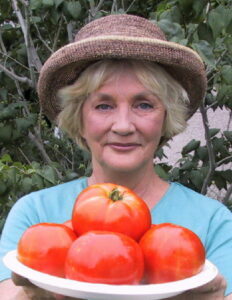 I’ll show you how to harvest perfect fruit that is undamaged by insects, wind, and sun. I’ll answer questions and talk about planting dates. Expect to be in class for at least an hour and then some time after to hang out, visit and ask questions. Hanging out in the garden afterward is really nice. 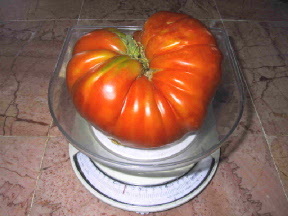 As a special bonus to students who want to buy bulk Tomato Lady Soil after class on Saturday, I will include 50% off the delivery charge, in my new truck, on 1 or 2 yards delivered within Las Vegas. The first 10 people to come to class, one per household, will receive a free seed starting kit like I use, plus you will be able to choose a pack of summer veggie seeds to start. Seed starting kits will be available to purchase. You won’t be starting seeds during class as I don’t have enough tables for seating, but you will be able to easily start them at home..
I’ll talk about how I grow my tomatoes and summer veggies from opening the seed pack to harvest. I’ll cover potting up; transplanting, irrigation, feeding, insects and my tips. Tips that will help you grow too many tomatoes. Expect to be in class for at least an hour and then some time after to hang out, visit and ask questions. Hanging out in the garden afterwards is really nice. I will have a booth stocked with Hawaiian Tropic tomato plants. I am bring my special tomato and vegetable plants, and other gardening products we use in the test garden, to the Craft Fair at the Springs Preserve. Would you like to host a gardening workshop? More workshops and events will be scheduled and I will post them on my website and send updates and reminders as the classes approach the class date and when new classes are added. You may request to host a class at your home, church, school or business location by contacting me by phone: 702-472-3258. Locations for classes are especially needed in the Henderson area and Southwest area of the Las Vegas Valley.